Posted on July 9, 2018 at 12:51 pm. Each month, talented Kristin Lewis Foundation scholarship award winners or finalists will be presented in La Fermata. They will be lovingly referred to as “Nightingales” and “Troubadours,” in homage to artists who have shared their gift of beautiful singing throughout history. The Kristin Lewis Foundation, an organization that shines a spotlight on talented musicians, is extremely proud of all the wonderful singers who participate in its scholarship program. The fifteen finalists chosen from universities and colleges across the country each year are invited to Arkansas for a two-day audition process, in competition for financial awards. Each participant is given an invaluable opportunity to work with esteemed professionals from leading, international opera houses during the scholarship auditions. These singers are among the next generation of great artists who intend to grace the world’s top opera stages. 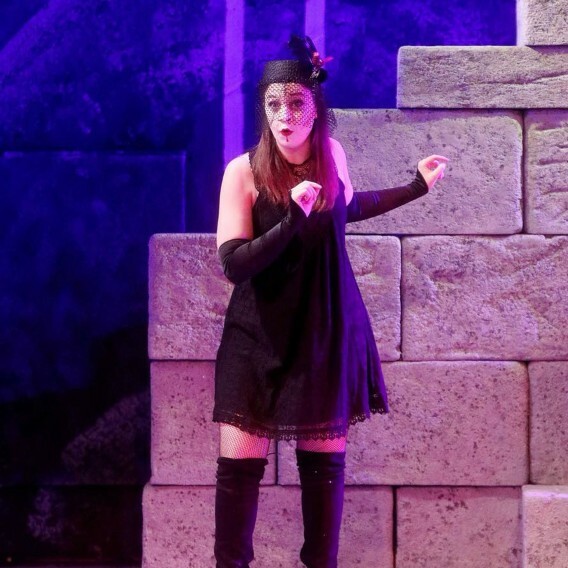 Naomi is quickly gaining recognition as an “expressive, athletic and strong-voiced” presence on the operatic stage and “lights up every scene she’s in” (Naples Daily News). A native of Belmont, MA, she is currently an apprentice artist at Des Moines Opera. In addition Naomi is presently singing the role of Third Wood Sprite in the mainstage production of Rusalka. Earlier in the year she joined Opera Naples as a resident artist, where she performed the roles of Cherubino in Le nozze di Figaro and Giannetta in L’elisir d’amore under the baton of Ramón Tebar. Other recent operatic roles in which she has performed include the Dritte Dame in Mozart’s Die Zauberflöte with Opera in the Heights, Sesto in Mozart’s La clemenza di Tito with Chicago Summer Opera, and Zulma in Rossini’s L’Italiana in Algeri with Operativo Houston, where she also covered the role of Isabella. Further operatic highlights have included Nancy in Britten’s Albert Herring and Rebecca Nurse in Ward’s The Crucible. Equally at home on the concert stage, Naomi has appeared as an oratorio soloist with Palm Beach Symphony, Emerson Unitarian Universalist Church, Houston Lutheran Choral, and Boston University Concert Choir. 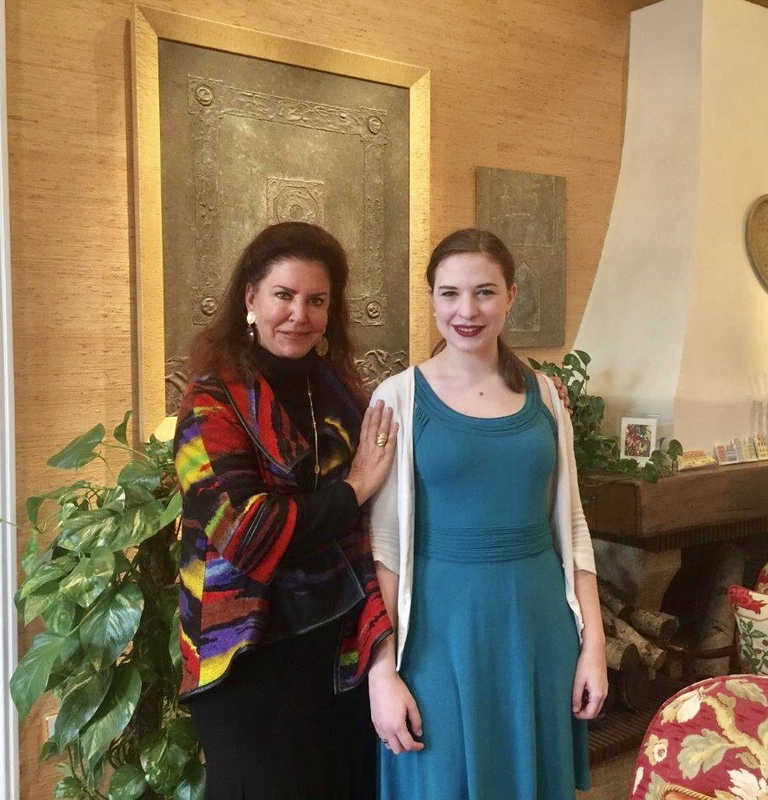 In 2017, Brigell was awarded the Kristin Lewis Foundation Vocal Scholarship Competition’s grand prize: a residency in Vienna to study with operatic soprano Carol Byers, coaches from the staff of the Wiener Staatsoper, a noted stage director and native speaking language/diction coaches. 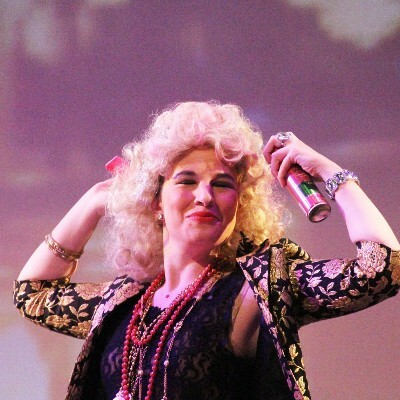 In 2018, she was first runner-up in the Madame Rose Competition at Mobile Opera. During her formal academic studies, Naomi was awarded titled scholarships, including the Winifred and Maurice Hirsch Memorial Scholarship at the University of Houston and the prestigious, Ellalou Dimmock Vocal Honors Award at Boston University. 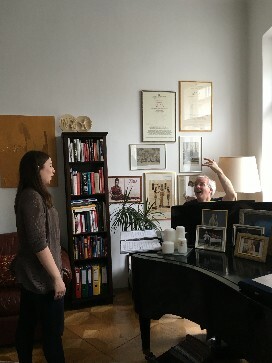 Naomi Brigell with German vocal coach, Werner Lemberg. Naomi Brigell with operatic dramatic soprano and voice teacher, Carol Byers. Naomi Brigell with European Stage Director, Peter Pawlik. “My lessons with Carol Byers were really helpful for reminding me about certain aspects of my technique that I have neglected recently, and also for helping me find my fullest and most mature sound throughout my entire range. I loved the fact that she never let me get away with even one tone that was less than my best– that helped me make sure that I was singing as well as I possibly could throughout an entire piece! She also helped me get more into my body when I sing, which is something that I have struggled with in the past. All of my coachings were also incredibly beneficial. I worked very closely on language skills with native speakers (German with Werner Lemberg and Italian with Luisella Germano). I worked on phrasing, musicality, and the “big picture” of each aria with David Aronson. Also, Peter Pawlik helped me to theatrically work through my characters in a completely natural way, where I was using the way I act in everyday life to help motivate my characters and their movements. He was especially helpful for physicalizing my pants role characters, which is, of course, always a challenge. It’s safe to say I completely fell in love with Vienna. Not only is it beautiful, but it has such a rich arts and musical presence that is around every corner. Being able to participate in so many cultural activities and go to so many performances was such a delightful and immersive experience that I won’t be forgetting anytime soon. I also must thank the foundation for supporting me financially, allowing me to enjoy the city and all it had to offer without worrying about financial burdens.